What's in a Name? You may be wondering how we came about naming our business, The Orange Bandana. 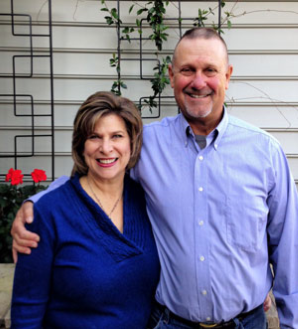 When Dave and Nancy met and began dating, they would sit for hours and talk about goals, dreams, heartaches, family, friends—you know, the kind of conversations you have with the person who is becoming your best friend. Dave carries a colorful bandana daily as his handkerchief. He has a bandana matching every color of the rainbow and maybe even more than that! On those occasions when the conversations evoked tearful emotions for Nancy, Dave would reach into his back pocket and hand her his bandana—to wipe away those tears of laughter, joy or sorrow! And it seemed that without fail, he handed Nancy an orange bandana. Finally, Dave remarked, "I think this orange bandana belongs to you!" At The Orange Bandana, we feel that life is full of moments that bring us happiness and joy, surprise and delight. We would like for you to have your own orange bandana to capture your moment. And so it is our gift to you and a reminder that we need to recognize all of life's moments and share them with others. Let us be a part of your next special occasion. Thanks for stopping by!